For questions you have that other people might have as well, please use the comment forms you’ll find on every page. That way others will benefit from the answer too! For any other contact need, email me at davidhobartyfv@gmail.com. For my social media accounts, click the links: Facebook or Twitter or Pinterest. My son and his family, wife and 3 boys, is looking at visiting Disney World Orlando in May 2019. He is looking at Disney’s Art of Animation Resort with a “Cars” family suite for them and a Little Mermaid room for Granny and Grandpa. My question is that it looks as if they are far from each other. What would you suggest? Hi Des, the closest family suites at Art of Animation to the Little Mermaid section are in the Lion King section–which is also quieter, as it does not surround a pool. The Cars suites are the farthest. ANother option for you to consider is All-Star Music. It, too, has both family suites and regular rooms, but they are in the same buildings. Overall, All-Star Music is not nearly as delightfully decorated as Art Of Animation. It’s “standard” rooms have the same layout as the Little Mermaid rooms (unless they are refurbed by May 2019, which is possible–if that’s so, they will have queen beds, rather than the fulls of Little Mermaid). The family suites at Music have a roughly similar master bedroom, but different bedding options (and overall much duller decorating). Music is also much cheaper than AofA (e.g. $100 a night less for the family suites). A full review of All-Star Music begins here. Why don\’t you own the domain name myfirsttrip.com? I saw it for sale at Sedo.com. I was wondering if you would be able to help plan an itinerary for me and my daughter. I’m taking her as a surprise so it’s hard to try and plan it out with her right next to me. We are going from August 15th-23rd. We have 7 day park hopper passes. We also have the regular dining plan. It’s both our first time going. Hi Coral, how old is your daughter? Hi Dave, She will be turning 9 the day we get there. the 15th and the 23rd are travel days. Hi Coral, so sorry, I missed your last comment!! At that age, you are good for everything. I’d advise 1.5 days at each of Epcot, AK, and HS, and 2.5 days at MK. Focusing on full days, I’d suggest MK on 8/16 and 8/21, Epcot on 8/17, HS on 8/18, AK on 8/19. 8/20 could be split between HS and Epcot, and 8/22 between MK and AK. I don’t have any itineraries on this site that you can use for this, but you can adapt what is here: https://yourfirstvisit.net/2017/05/11/disney-world-higher-crowd-itinerary/ Note the changes it suggests for Hollywood Studios. 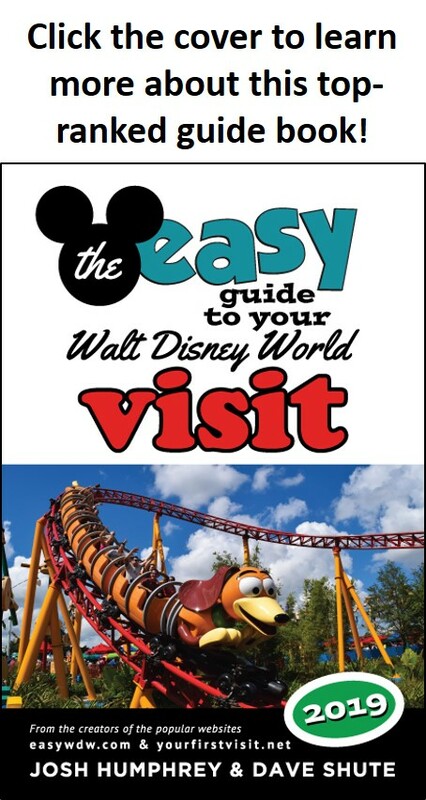 In it you will find my recommmended dining and FastPass+. Perfect thank you Dave that helps alot. I truly appreciate it. Hi, not sure who Nathan is, but pretty much all of my ad content is managed by Adthrive.com, so I don’t do deals separately from them…but thanks for asking!!! Hi, Dave, its been a bit since I reached out. My family of 4 will be travelling to Disney May 2019 and staying at the Caribbean beach resort ( which I PRAY will be finished with the Port Royal Construction)I am truly stuck on this DDP. Im doing numbers on these DDP calculators and its coming out to about the same if i do QS or just pay out of pocket there. In my head I have these lunch breaks and snack ideas but am traveling with a 6y/o picky eater and a 7 y/o that can handle an adult meal if really hungry. Meals with them in amusement parks are hit or miss . I would like to do a least 2 TS meals. 2nd dilemma – to do or not to do EMM fantasyland and Toy story land. My hubby hates the rush and pushing of crowds. This is our family’s first trip and Im trying to make it as stress free and leisurely as possible. It is expensive but for the sake of my sanity the $$$ may be worth it. Hi Deanna, ping me back after Disney’s operating hours for then are out, as I’d just be guessing before then–try in six weeks or so. I don’t see much value to EMM at MK as only three rides are eligible, and one of those is easy to see. With two MK days and two rope drops, you should be able to see 10-12 rides that will build high waits quite easily. HS is another matter, but the Toy Story Land mobs may have settled down by then. Everything at CB except the Gondola will be done by then. I don’t see much value to the quick service plan, except for the comfort of knowing you’ve pre-paid. THanks so much! 🙂 talk to ya soon. Numerous website states that you can have a 5th person in a villa, if you supply the bed. I think you should alert your readers that Disney will give you a hard time about this. Appreciate your very informative website! Thans Dianne! So far as I know, the ability to book an “extra” person is restricted to folks staying on points, and is not true across all DVC properties/spaces. On this site, I ignore the issue, as my intended audience is not folk staying on points. If you are staying on points, to find an alternative, you might want to post on a DVC discussion board. If you are not staying on points, then one bedrooms at OKW, AKL, GF, and BLT are bookable for five. The fire point is true but less than meets the eye. The fire inspection is based on what Disney provides, so if it says “four” when it goes for approval, that is what it will get. It can then go back–which is how some CB rooms shifted from four to five. Thanks for the enlightenment, Dave. I think there are a couple of websites that need to make that clear, because they sure misled me! Thanks for always answering my questions Dave, you’ve been a great help in planning our trip. I’m piggybacking a little bit off Deanna above as we are going to Disney almost the same time, May of 2019, 8th-14th specifically, and we will need to reserve some of our dining options a couple weeks from now (we are doing the Dining Plan). We don’t plan on having Park Hoppers so I’m trying to figure out what the best days of the week in general to be at each of the parks so I can making dining reservations accordingly. I understand that specific schedules for this time period haven’t been released yet so you can’t answer definitively, but in general do you any advice in regards to what days of the week to book at Magic Kingdom etc.? Any days you try to avoid any of the specific parks? If this is reviewed elsewhere on the site then my apologies, you’ve got so much great stuff on here I may have just missed it. Thanks! Hey Don, and thanks. I don’t have anything useful to say–but this might https://www.thedibb.co.uk/forums/parkhours.php?hours=5+2019 I’ve been tracking it for a few months, and it seems pretty reliable. Patti, I’ve pushed folks in wheelchairs through all four parks, and MK and HS are best–they have the most compact layouts. Either is a good choice that day, but MK is the quintessential DIsney WOrld park, so that’s what I’d advise. 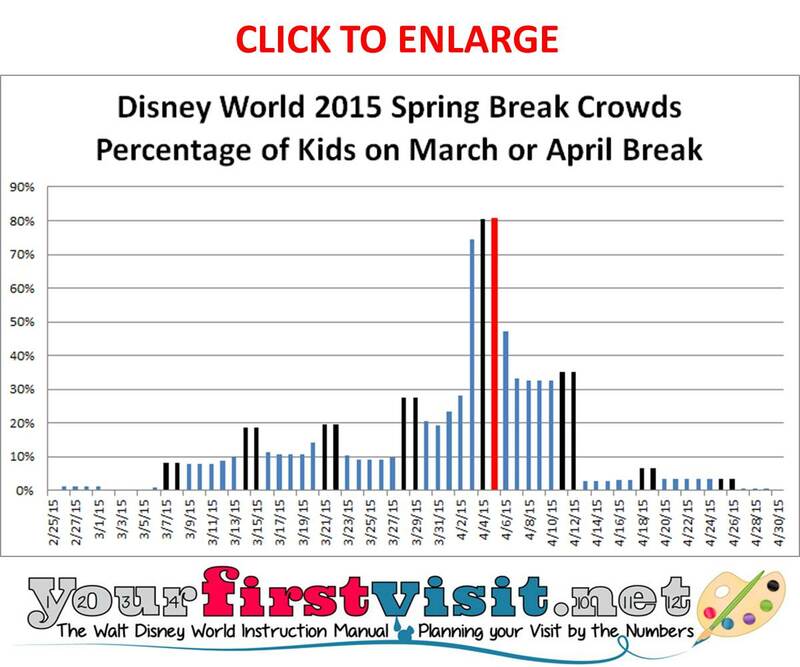 See this for more on the differences among the parks. We are a family of three, mommy, daddy and almost a 4yr old girl. We want to go to Disney but I’m not sure how long should we stay there and if we should get all the bells and whistles. We want to do the character dinning and have a celebration for her birthday in there. Please let me know your recommendations, I’m planning to go the first or second week of May. For sure we want to stay in their hotels but not sure about the fast pass or anything like that. Andrea, read through this and this. You absolutely will need to use FastPass+–which is free with your ticket. The first link gives an overview of the parks to help you sort out what to see, and also talks about FastPass+. The second link notes some of the issues with a younger child. I am from NY. The last four years my family and I have gone to WDW the last week in August leading into Labor Day. Because my daughter now has varsity sports practice that starts earlier, this year we are going August 10 – 17. Will the crowd levels that week be significantly worse? Usually when we go that last week in August we can find plenty of rides/attractions with a 30 min or less wait, then wisely use the fastpasses for the more popular ones. Will everything be close to an hour going a few weeks earlier? Rick, there’s a pretty big difference between those weeks most years, but a sound set of plans should trump the extra waits. Also, if you have not done this in the past, refresh FastPass+ availability after you’ve checked in for your third. Especially at MK, you can have a lot of luck with this. We are arriving March 31, 2019 and checking out April 3, 2019. “We” will include my daughter, 29; my grandson, 13; my granddaughter, 4; and myself, 66. First time visitors to Disney World and probably the only time we will ever go. Special issues: daughter has severe celiac and is disabled, and she also suffers from fibro. I want to take her to Disney World while she can still travel. I have back issues. We need comfortable, queen size beds because of her pain level, but we cannot afford the deluxe resorts. My daughter is a member of World Adventures so she will have some points to apply to our resort stay, and I am a senior citizen and member of AARP, if any of this helps at all. Also important, we need to stay at a location convenient to gluten-free food. I have been looking at Art of Animation; however, the beds are full size and the suites here are at a price comparable to the moderate level resorts, which have more room square footage. Do all of the Disney resorts offer free transportation from the airport? I feel like free transportation for the four of us from the airport is critical versus paying for a taxi transport, which would be very expensive, I would think. Although kid friendly would be great for our four year old, the comfort of the bed and the gluten free food for my disabled daughter trumps the kid friendly atmosphere. Thanks in advance for any help you can offer. I am over-whelmed, and our trip is fast approaching! –Art of Animation suites at about 565 square feet are almost twice as big as moderate resort rooms. See this. However they have only one queen bed. The least expensive way to get all queens in a Disney-owned property is at Pop Century. Two rooms there will be comparable to the price of a family suite. –Airport transport is free to a Disney owned hotel but you have to sign up for it–it’s called Magical Express and explained here. This only works at the Orlando airport MCO–it is not offered for the Sanford airport. –All the Disney resorts are great at gluten free, but the best are the ones that simply have larger dining operations and more choices. Any value resort or moderate resort would fall into this class. Now to the harder point–you’ve picked a terrible week in terms of prices and crowds, and are awfully late in booking it. Rooms may be scarce (although it’s a help that you are checking in on a Sunday, and I just checked and several values and moderates are available, including Pop Century). Since you are already 27 days into what would normally be your 60 day FastPass+ period, some rides will already be harder to book, and the longer you wait (especially once you cross the 30 day window), even more will be. Moreover, most of the most popular dining may be already booked. Hi Jacqueline – I’m Kelly – Dave’s designated Travel Agent. I would love to help you sort through all the information you’ve stated. Dave has made some great suggestions. Pop is probably the way to go. I did a quick check of availability and am seeing some for your original dates. But with the special needs you have, you would do better planning further out. In saying that, there is extremely low availability for value resorts from the end of April through mid May (completely sold out for most of those dates). Please feel free to call me at 980-429-4499 or email me at KellyB@DestinationsInFlorida.com. All of my services are completely FREE when you book your Disney vacation package with me and Destinations In Florida. I am trying to plan a trip for next spring (DVC BLT since 2012) and I have a question on your annual week rankings that you do, specifically for the month of April. I noticed that for 2019 Easter is on Sunday April 21 and you have both the week before and the week after as some of the lowest ranked (46 and 43 respectively) and busiest times of the year to visit Disney. I was looking at the Disney Gold annual pass and it has those 2 weeks (along with Christmas time) blacked out, essentially confirming it as a busy time. These dates also happen to be school vacation week in Massachusetts (where I live). My question is for this same time frame in 2020. Easter is earlier next year, April 12, 2020. Similar to 2019, you have the week before (4/04/20) and the week after (4/11/20) some of the lower ranked weeks to go (45 and 44) as well as an 11 rank for crowds. The difference for 2020 is that school break is not until the following week, 4/18/20. This week is ranked #9 best week to go in 2020 with a crowd ranking of only 4. Is it that the weeks in 2019 are that busy because of Easter or because of vacation week? So for 2020, wouldn’t vacation week also be a bust time to go or is it more correlated to Easter as opposed to vacation week? Thanks for your help in advance and I hope I didn’t confuse you with the way I worded my question. Michael, spring break dates vary substantially. The majority are tied to the week before or after Easter, so they vary every year. The rest most commonly are tied to a specific period of a specific month, and for these, most are in the latter three quarters of March. Massachusetts–which I am guessing you are from–is the only state to tie its break to the late-April Patriots day. Thus in years with an earlier Easter, MA folk get their break at a time that is good to go to Disney World, as hardly anyone else is on break then.